The following story is on display at Hotaru Museum in Chiran Town, Kagoshima Prefecture. 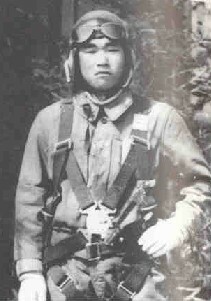 Corporal Chuji Asami, the 19-year-old soldier in the story, departed from Chiran Air Base in 1945 to make a suicide attack on American ships near Okinawa. Tome Torihama, who operated a restaurant visited by many kamikaze pilots, tells the story about Corporal Asami and her two daughters, 14-year-old Reiko and 18-year-old Miako. Corporal Asami was a gentle young man who loved to play records all the time on the phonograph at the Tomiya Restaurant. But for some reason he really hated cats, or better said, he had a cat phobia. There was a black cat at Tomiya Restaurant. One time when Reiko was holding that black cat and approached Corporal Asami who was listening to a record, in an instant his face contorted. In the next instant he shouted loudly, "Oh!" Then he jumped up and fled as he tumbled down the stairs making a huge racket. After that, it seemed that he never neglected to warn Reiko to not come near him with a cat. Reiko would enjoy herself by walking around while holding the cat. Corporal Asami would flee. Reiko would playfully follow him when he ran away. "Asami, if you're scared of a cat, how can you fly a plane?" Asami answered in a displeased manner. "Planes and cats are different." "I was born in the Year of the Mouse, so I'm afraid of cats." "No. I'm an eagle." He would reply with a serious look on his face. When inside an air-raid shelter during a bombing attack, my oldest daughter Miako teased him saying, "Asami, there's a cat in here." On hearing this he made a big disturbance and ran out of the cramped air-raid shelter. He hit his forehead as he ran out and blood ran down his face. The next day Tome got angry with Miako for hurting a precious soldier. The following day he departed for Okinawa still with a gash on his forehead.